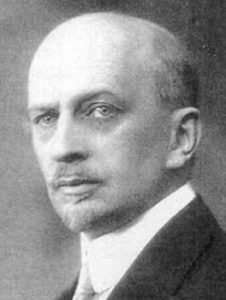 Vladimir Putin’s macho-Christian-nationalist rule begins to make sense or at least have coherence reading reviews of a new book out on his philosopher-hero Ivan Ilyin. Putin had his remains repatriated and made Ilyin’s essays required reading. Ilyin, born 28 March 1883, disliked Bolshevism and, in exile, gravitated towards Hitler and Mussolini, from whom he developed the notion of Russian fascism. This perceived a Russia under a strong masculine leader where individualism amongst the populace would be subdued, allowing the country to speak with one voice. ‘Alien influences’, ie. anyone who disagreed or held different beliefs, would be suppressed – Muslims, homosexuals etc. The Russian spirit would therefore prevail. ‘In this culture war, disinformation was critical. The more outrageous the official lie was, the more it allowed people to demonstrate their faith in the Kremlin.’ ‘Russian power is displayed in a relativist blizzard of alternative theories, delivered in a vaguely absurdist spirit, as if no truth on earth is really provable.’ (Guardian URL below) And not only at home, Putin’s disinformation campaign abroad has been geared on the same principles towards undermining democracy – in supporting Le Pen and Farage, RT suggesting the Scottish referendum had been rigged etc, never mind Trump. 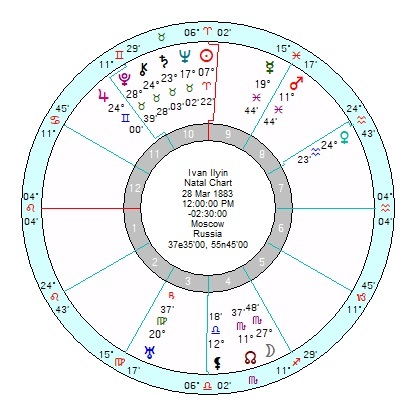 Ilyin was a Sun Aries; with Saturn midway between Neptune and Pluto in Taurus trine Uranus. Uranus would make him a reformer, and Saturn Neptune Pluto would give him a tendency to dabble in strange ideas, part mystical. Saturn Pluto is bleak, repressive; Saturn Neptune is concerned with re-ordering society; Neptune Pluto has overtones of megalomania. His Uranus also opposed Mercury in Pisces squaring onto Jupiter in Gemini – confident with grand ideas, idealistic about social order, impractical, philanthropic. Putin shares Ilyin’s Saturn Neptune conjunction, though in his case it’s in Libra; and Ilyin’s Saturn Neptune is conjunct Putin’s confident Jupiter in Taurus, giving Putin a template for his political strategy. 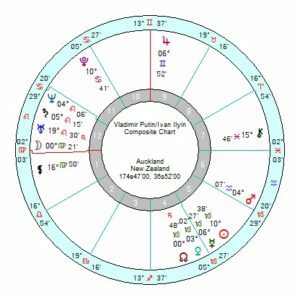 Their relationship chart has a powerfully connected and transformational composite Sun Mercury opposition Pluto; though also a bizarre collection of Saturn Neptune opposition Mars, sextile/trine Jupiter which will get a sharp elbow come 2019/2020. Perhaps the guru will fall off his pedestal. Certainly explains those odd Putin as John Wayne bare-chested on a horse pics. I’d be looking at Ilyin and Russia 1991 chart, too. Reason? Many “Kremlinologists” noticed a stark sense of tone for Putin some time around 2010. He became much more Traditionalist he’d been for the first 10 years in power (real and nominal). Yes, there had been the Chechen Wars, Armenia, “protecting” Russian minotities in Former Soviet States, but otherwise, Russia seemed to be steaming to 21st Century. The idea put forward by people knowing Putin is that he is a pragmatist. He actually didn’t come out of “nowhere”, his family line had a long string of solid Bolsheviks (you couldn’t get to KGB training in the 1960’s otherwise). He is an atheist. With Global Financial Crisis fractioning Russia’s oil and gas revenue they rely on, Russians faced tough times financially. Ilyin was becoming popular. Putin saw a great way to control masses here. While Russia was in turmoil internally, he convinced people that at least everybody else was worst off and that only he could protect Russia Internationally. And, since most Russians do not have access to any foreign media, he succeeded. But it’s obvious Ilyin is just a tool to Putin. His ideology will be disregarded the moment it doesn’t work anymore (and this might be just one ruble course crash away…). I never got Putin’s sudden Christian/religious fervour. Always seemed v odd. Is the given date (also in Wiki) old-style? Probably. Russia didn’t institute the reformed calendar until after the 1917 revolution.